Inside NASA's Goddard Space Flight Center the James Webb Space Telescope team completed the environmental portion of vibration testing and prepared for the acoustic test on the telescope. 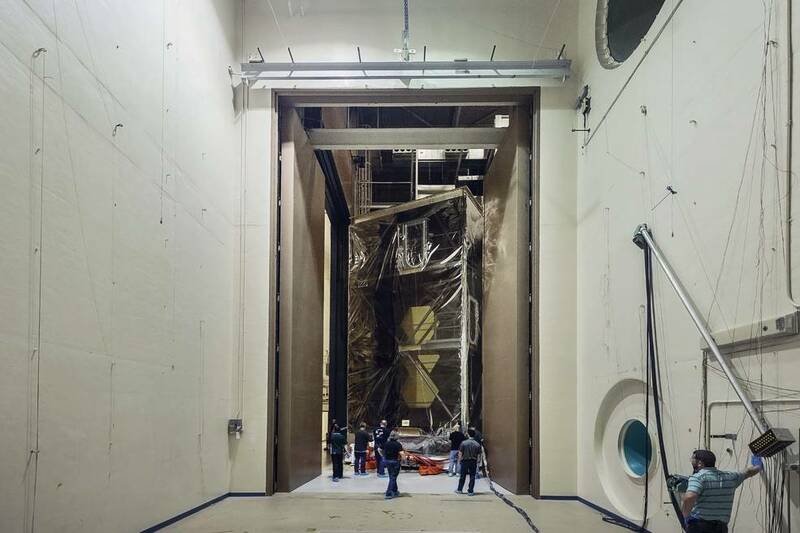 Engineers and technicians pushed the telescope (wrapped in a clean tent) through a large set of insulated steel doors nearly 30 cm (one foot) thick into the Acoustic Test Chamber, where the telescope will be exposed to the earsplitting noise (and resulting vibration) of launch. This photo shows the telescope outside the acoustics chamber. It was captured by the photographer who was standing inside the chamber.